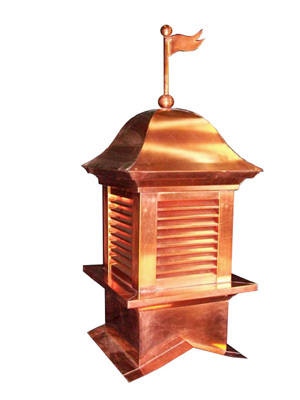 Copper coil and copper sheet are available for order. For copper coil and copper sheet orders please call for pricing and availability. 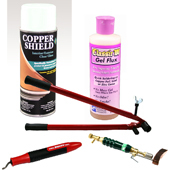 Most of our copper products are made from 18 oz. copper. 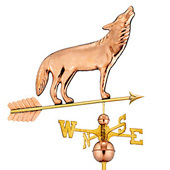 All of our products are of the highest manufactured quality. Clay chimney pots are sold in many sizes and styles. Custom glazes also available . 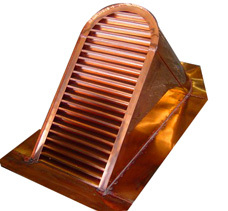 The World Gutter System is the best quality half-round copper gutter system available. 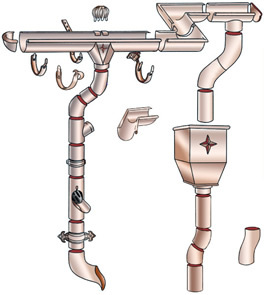 The World Gutter System’s gutter and downspout are made in 20 oz., 18 oz., and 16 oz. copper. Our gutter profile is deeper. We use wider copper coil (girth) to fabricate our gutters. 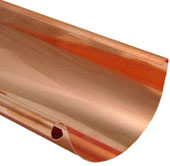 Our 4” half round gutter has as much copper as a standard 5” half round. 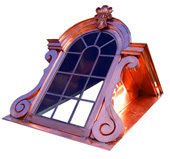 Our 5” gutter has as much copper and moves as much water as a standard 6” half round gutter, and so on. You get more copper with the World Gutter System!!! Our hangers are the strongest solid copper half round hangers in the world. We designed our hangers with a deeper structural rib that travels along the length of the hanger. This deeper rib results in our hangers being far stronger than any others on the market, as well as more attractive. Also, the holes for the mounting screws are recessed so that the top of the head of the screw sits flush with the hanger. The result is that a roof sits flatter upon our roof mount hanger and there is no pressure exerted by the screw against the gutter when using our fascia mount hanger. No other company has this feature.